Every year with Catholic World Mission, you get the chance to be a Christmas miracle for a person in need. The premise is simple: we, who have so much, can give a poor child, family, or community something to smile about on Christmas morning. And this year, our hearts are focused on a very special community in Kurunegala, Sri Lanka. 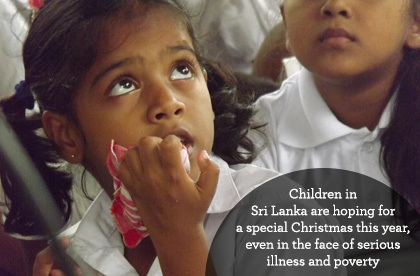 Read on to learn how you can make Christmas special for children battling a blood disease and cancer, blind families, and Kurunegala’s farmers. Sri Lanka is a beautiful country, full of natural beauty, tropic-like weather, elephant preserves, and kind, hardworking people. But one disease is ravaging the country. Thalassemia is a genetic blood disorder. There is no cure, and the only way to treat it is with regular blood transfusions. Between 2010 and 2016, the number of new cases of thalassemia found in Sri Lanka was 1,547. Of those, 1,023 patients lived in Kurunegala. More and more children are born with thalassemia every year. 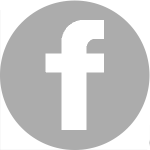 Symptoms include fatigue, weakness, and a shorter life expectancy. Treatment is costly, and the frequent hospital visits have a deep impact on the children’s social and psychological development. Thalassemia patients are also often stigmatized, even by their own family members! The children who suffer from thalassemia are not nameless. 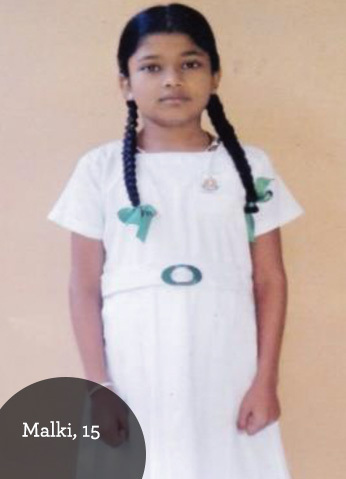 They are children like 6-year-old Sudarshani. She’s in first grade, and her dad is a farmer. Or 15-year-old Malki, who’s in 9th grade. Despite her disease, she’s like any other teenage girl, except she must come to the hospital once every month for a life-saving blood transfusion. 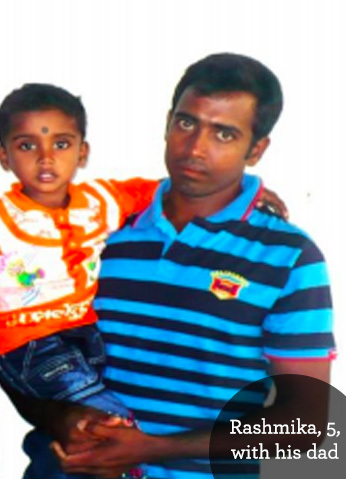 Or 5-year-old Rashmika, who was diagnosed with thalassemia when he was just 18 months old. You can give 800 children like Sudarshani, Malki, and Rashmika—and 200 other children battling cancer in the same hospital—a joyous and happy Christmas morning! 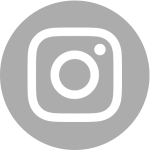 Our partner, Fr. Sagara, already has a plan for Christmas Day: he and his team have planned a day full of Christmas cards, games, and even an appearance by Santa! But he needs your help to make it happen! A meal and a small toy for all 1,000 children will cost just $1.71 per child! That means that $25 will provide this amazing Christmas miracle for 14 children; $75 would provide for 43 children on Christmas Day; and $300 would give 175 brave children a Christmas they’ll never forget! For 200 blind families in Kurunegala, life can be especially difficult. Arul, 50, earns his living by making candles. But it isn’t enough for him and his wife to survive on. 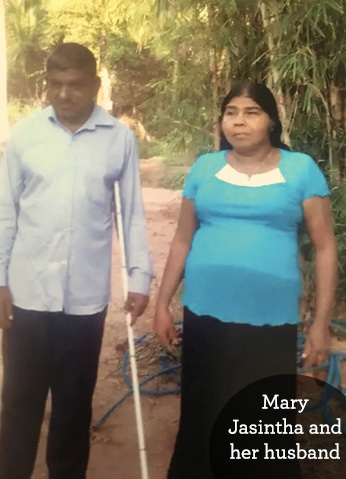 Mary Jasintha, 54, tells us that she and her husband “always try our best to see the brightness of our lives despite our blindness.” But even their positive attitude can’t erase the many difficulties being blind adds to their lives. Even daily chores are extra difficult, and Mary Jasintha and her husband are self-employed. But they can’t make enough to meet all their needs either. Fr. 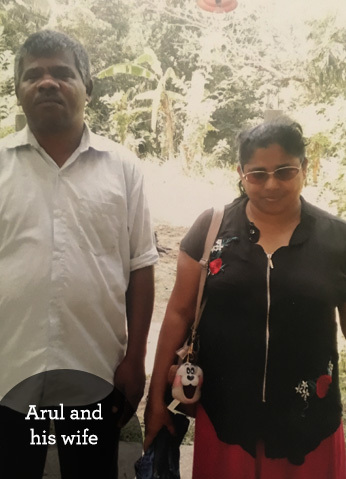 Sagara wants to bless Arul, Mary Jasintha, and the other blind families this Christmas, too. The plan is to give each family a package of dry rations that will last for months. Each package will include rice, milk powder, lentils, sugar, and other non-perishable food items that will help these hardworking families throughout the coming year! A dry ration pack costs just $11.35! 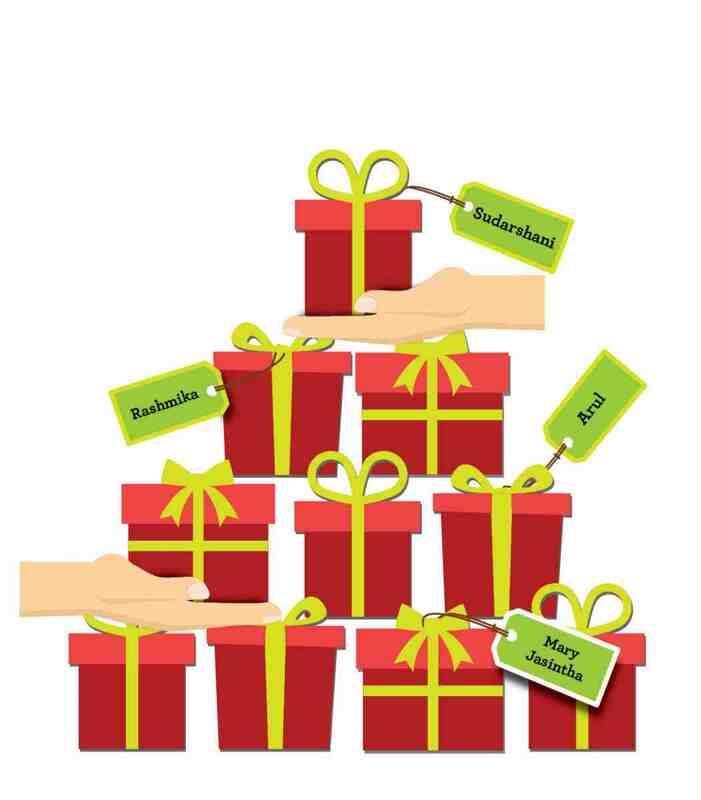 So that means $35 will bless 3 blind families with a dry ration pack; $57 will give 5 families a dry ration pack; $114 would give 10 blind families a truly special Christmas Day! Subsistence farmers grow only what they need to survive. They are often poor, and lack the resources to grow surplus crops, which they could then sell or trade for profit. 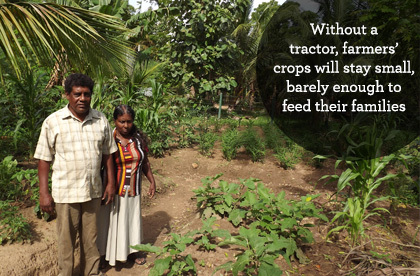 In Sri Lanka, almost half of poor rural people are small-scale farmers. And in Kurunegala, a majority of the population is employed in agriculture—mainly rice paddies and raising livestock. The Diocese of Kurunegala has recently been given the opportunity to purchase a tractor for the local community. 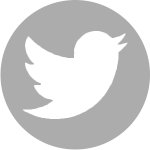 This is a BIG opportunity that could have serious, positive, long-term effects on the community. A tractor—shared among the whole community—will allow the local farmers to farm more efficiently, create more sustainable systems, and produce more food for their families to eat and sell. A new tractor could be a key component in ending the cycle of poverty in Kurunegala. 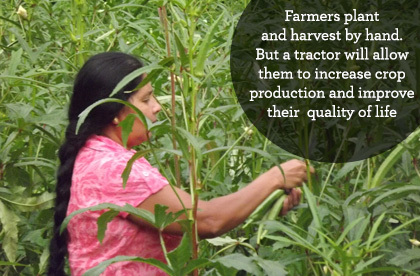 It will be used as part of a community training program to help 3,600 farmers each year! So how much will a tractor cost? This is certainly no small feat, but we know that together, we can do anything. And it’s truly a small price to pay when you consider that this tractor will give thousands of people freedom from poverty. 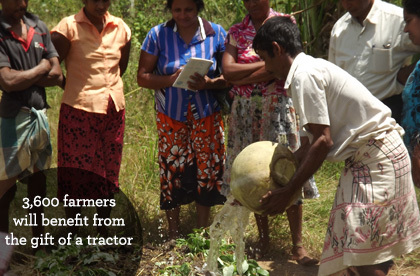 A Sri Lankan family’s share of this tractor is just $4.26. Yet they don’t all have the means to contribute $4.26 towards their community’s new tractor. How many shares can you provide? $50 provides about 12 families’ shares of a new tractor; $500 provides 117 shares—117 families who will have a vital tool in fighting poverty; and $1,000 provides 234 families with access to this life-changing machine. With three tremendous ways to make a difference for our sisters and brothers in Sri Lanka, we hope your heart has been moved to bless them with a Christmas miracle. Will you stop and pray right now for the children who suffer with thalassemia, that they and their families never lose hope as they manage life with an incurable disease? Will you pray for the blind families, that their spirits would be strengthened as they continue to make beautiful lives with their disabilities? And will you pray, right now, for the farmers of Sri Lanka, who wait patiently for the resources they need to build better lives for themselves and their families? 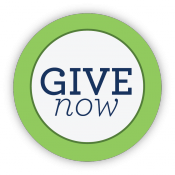 And now, please click the green “Give Now” button below to make the most generous gift you can, so these deserving communities will have an unforgettable Christmas morning. $114 gives 10 blind families a dry ration pack–food for Christmas and the year ahead!